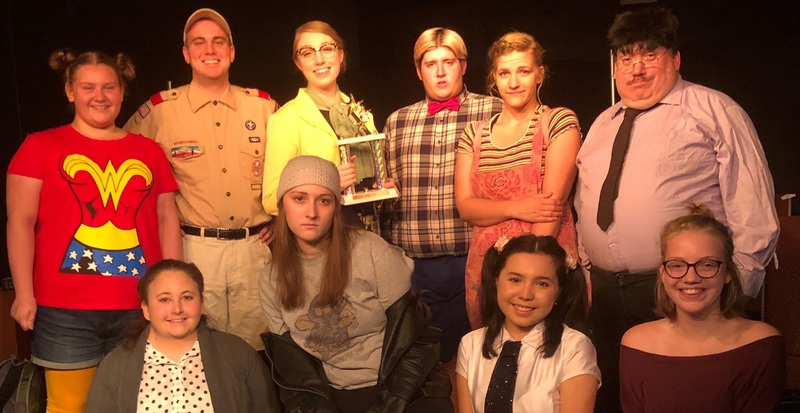 The Bradford County Regional Arts Council (BCRAC) is pleased to announce the 19th annual Winding River Players summer community musical, the award winning “25th Annual Putnam County Spelling Bee” at the Dunn Center for the Performing Arts in the Keystone Theatre on Aug. 3 and 4 at 7 pm and on Aug. 5 at 2 pm. Cast members are Maggie Poost, Katie Phykitt, Ryan Canavan, Tyler Sheets, Emily Canavan, Ezoza Ismailova, Julie Cooper, Mark McEwen, Mike Sarno, Whitney Madill, and Trinity McEwen. This is a wonderfully talented and hilarious cast of veteran and newcomer actors from Wyalusing, Towanda, Athens and Sayre. Winner of the Tony and the Drama Desk Awards for Best Book, “The 25th Annual Putnam County Spelling Bee” has charmed audiences across the country with its effortless wit and humor. Featuring a fast-paced, wildly funny and touching book by Rachel Sheinkin and a truly fresh and vibrant score by William Finn, this bee is one unforgettable experience. An eclectic group of six students vie for the spelling championship of a lifetime. While candidly disclosing hilarious and touching stories from their home lives, the tweens spell their way through a series of (potentially made-up) words, hoping never to hear the soul-crushing, pout-inducing, life un-affirming “ding” of the bell that signals a spelling mistake. Six spellers enter; one speller leaves! At least the losers get a juice box. A riotous ride complete with audience participation, “The 25th Annual Putnam County Spelling Bee” is a delightful den of comedic genius. The production is funded in part by grants from The United Way of Bradford County and Pennsylvania Partners in the Arts/BCRAC and through the Music Theater International. For reserved seating, please call the theater at 570-268-2787. Ticket prices are $12 for general admission and $10 for students and senior citizens.